In 1990, Volkswagen brought out the Corrado, which was marketed as “VW’s first full-blooded sports car.” The new Corrado replaced the outgoing Scirocco, and was outwardly very similar to that car. Under the skin, the 1990-91 Corrado shared many components with the A2 line of Golf/Jetta cars, but one notable feature of the Corrado was the active spoiler that raised itself when the car exceeded 45 mph and retracted when speed dropped back under 12 mph. 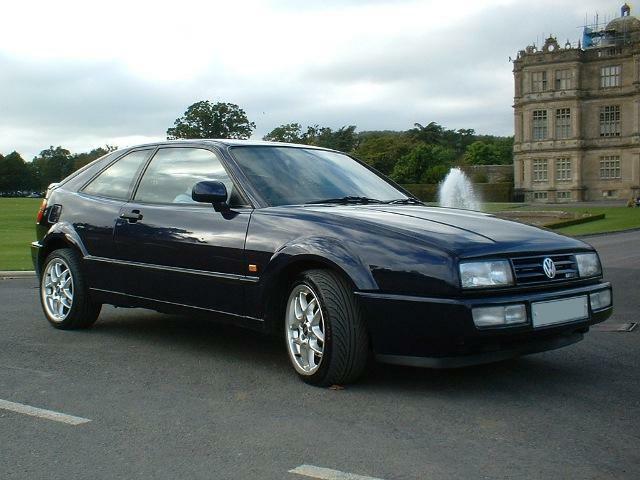 The Corrado also offered four-wheel disc brakes with optional anti-lock capability. The Corrado offered VW’s best performance to date, doing 0-60 in just 7.5 seconds with the G60 and 6.8 seconds with the VR6, and offering a top speed of around 140 mph. Fuel economy was mediocre but livable. The G60 Corrado delivered 21 mpg in the city and up to 28 mpg on the highway, while the VR6 version gave 18 mpg in city driving and 25 mpg on the highway. North American production volume for the Corrado was always low, with just about 3,000 or 4,000 cars per year coming off the assembly line from 1990-92, and then just over 2,000 cars in 1993 and 1,514 headed for America in the final year of production. The downfall of the Corrado was its price. It started at over $18,000 from the beginning of production, when the performance-oriented Golf GTI cost just $10,000 in the same year. By the end of the model run in 1994, the Corrado was priced at $25,150, about double the price of a basic Golf. The Corrado had all the ingredients of a future classic right from the get-go. Its low production numbers, especially compared to the many thousands of GTI and Cabriolet models, as well as its impressive technology and performance make it a car to watch. Clean examples can already be considered collectible. They’ve always held great respect among VW enthusiasts, and provided the car hasn’t been heavily modified, these are the type of people to buy one from. Collectors should look for good overall condition, paying special attention to the interior and components that are not readily available as standard VW replacement parts.